Custom Designed with a TSA checkpoint-friendly compartment, the Alienware Vindicator 2.0 Briefcase combines utility, protection and style. 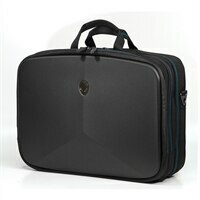 With a TSA checkpoint-friendly compartment, the Vindicator Briefcase allows for quick and hassle-free security scans. Each one of the 3 zippered compartments provides dedicated storage for your laptop and accessories, keeping you organized and ready to go. A durable high-density nylon constructed exterior keeps your goods intact with s unique and bold look. The high-density nylon constructed exterior of the Vindicator Briefcase delivers added protection while mirroring the bold look of the new Alienware laptops. A New Standard: With the iconic, matte black Alien head logo and the Alienware-engraved easy-to-use reverse zippers, the Vindicator Briefcase represents Alienware's new standard of style and direction.